Your certificate of ownership and horse's pedigree is an important document and PRE Mundial presents it to you in a beautifully bound Carta format. The Carta Mundial pays homage to all that was truly beloved about the Spanish Registry of the past, including a beautiful world-class "Carta". 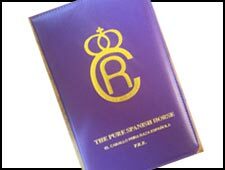 PRE Mundial traces back to the horses of the original Stud Book as maintained by the Cria Caballar for 100 years, keeping the registry as authentic as that respected body envisioned. Incorporating the traditional quality control system of years past (including the scoring system) to aid breeders and buyers in making informed decisions, PRE Mundial Registry offers breeders a modernized, streamlined approach to paperwork while rigorously authenticating all horses admitted to the registry. Most importantly - The Foundation and the Carta Mundial truly empowers breeders and owners worldwide by providing a forum through which they can express their views and opinions on the PRE Horse. Both Parents must be Pure Spanish Horses. NOTE: If your horse is an IALHA registered (S) horse, your complete IALHA registration papers will substitute for the breeding certificate and proof of ownership. When you submit the Proof of Ownership and Birth Certificate and Fee, the Registrar will send you a DNA Kit and Microchip (unless the horse has an existing chip). You will collect the DNA sample by pulling a few hairs from the mane or tail and return it to the Registry. The Registry will have the parentage DNA verified by University of California, Davis Veterinary Genetics Lab (VGL) a third party independent Institution. VGL is a leader in animal genetic research and continually breaking new ground in the field of Equine genetics. You can be assured that your results are valid and subject only to scientific inquiries. When the DNA Results are given by VGL, the Registry will research the bloodstock books and if all is in order, issue the Carta Mundial registration papers. One of the best tools available to ensure breed quality is the Revision of breeding stock. The Revisions offer breeders the opportunity to have their bloodstock evaluated, as well as see the results of other breeding programs. The outcome of revisions can increase the value of horses and also provide excellent marketing opportunities. The comments from the judges and their future breeding advice are invaluable to serious breeders. What is the Revision Process? In order to evaluate suitability for breeding the horse must be a minimum of 3 years of age and have been through the inscription process with a Carta in hand. (PRE Mundial has special arrangements for IALHA (S) registered horses.) The horse must have the overall appearance of correctness and be true to the breed type. The judges evaluate the horse’s conformation, movement and pedigree in relation to the strictly established breed goals. They must be free of the disqualifying morphological or conformational defects, such as a fallen crest, a dish face, or in stallions, must not be monorchid or cryptorchid. When a horse passes, the original Carta will be stamped ‘Apto’ (for stallions) or ‘Apta’ (for mares), signifying that he or she passed. 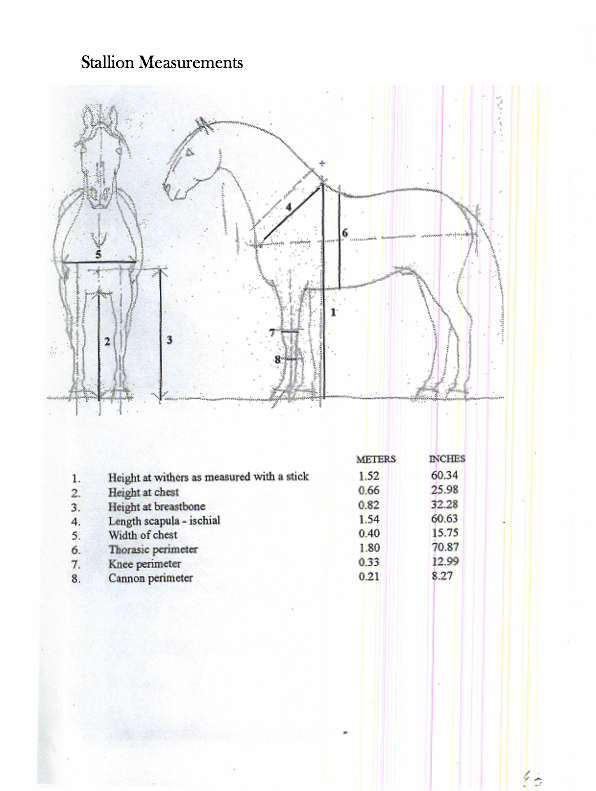 If the horse is approved, its offspring are eligible for the studbook. 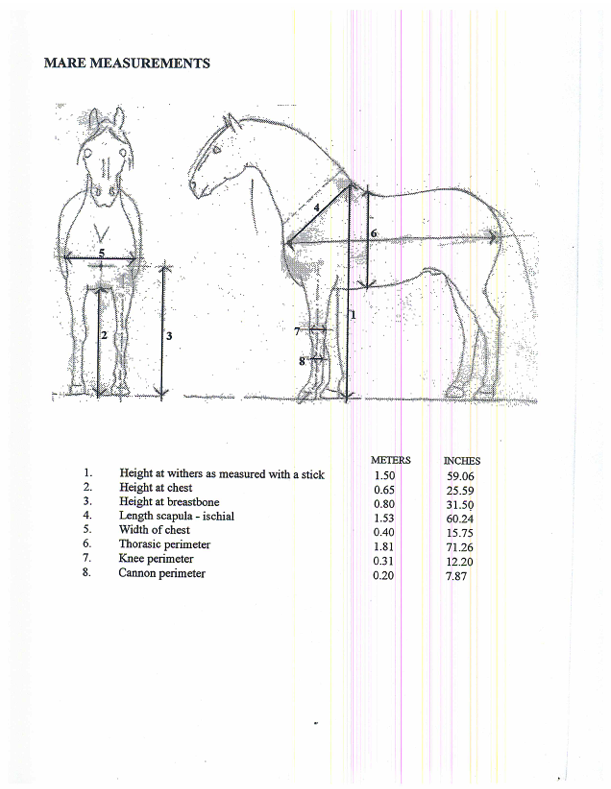 There is a minimum height of 1.52 M for stallions, and 1.5 M for mares. There is no on-line payment for Revision because we may not be able to schedule a Revision Site in your area. Please submit your Revision Application. The Registry will contact you with information on sites near you. They will be able to take your payment by phone or mail when a site has been finalized and you determined you will be able to commute.